Sport ID Bracelet, IDSP43 (ID Tag size 1-1/2" x 3/4"), is made from .062" thick premium grade Stainless Steel. 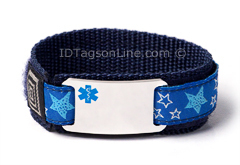 Blue adjustable wristband allows max length of wrist 6.5". It is guaranteed to be rust free for life. This medical logo comes in Blue color. You can choose, also, Red, Pink or Clear colors. We can engrave 5 lines (3 lines with 12 Characters Max. and 2 lines with 16 Characters Max. in each line) of personal or medical information on the tag.